PG&E acknowledged Monday at least eight incidents in the past eight days. This is significant because Cal Fire is investigating the possibility that downed PG and E power lines started one or more of the North Bay fires. Investigative Reporter Jaxon Van Derbeken reports. Pacific Gas and Electric Co. officials revealed Monday that they have officially notified California regulators of eight separate electric equipment failures in the recent North Bay firestorm – but declined to detail what triggered them. PG&E referred questions about those reports, however, to state regulators, who did not respond to several requests for details made by NBC Bay Area. The eight incidents – now being probed by state regulators as well as Cal Fire – are relevant given that the CPUC has long been grappling with a particular fire-safety threat posed from the state’s 4.2 million power poles. Public Utilities Commission President Michael Picker said Monday that regulators are not able to even determine some basic information about those utility poles, including the nearly 2 million maintained by PG&E. The commission has begun the task of trying to overcome the information gap to create a centralized database. Meanwhile, regulators have been sounding the alarm about those unknowns. “Pole problems and violations will cause serious injuries to the public and damage to properties,” one regulator stressed during a briefing to the Public Utilities Commission. One danger is that poles can rot from the inside out, said Fadi Daye, a supervisor with the commission’s Electric Safety and Reliability Branch, during the commission briefing in May of last year. Another, Daye told the commission, is that poles can be overloaded with unaccounted for gear, weighing them down. “That’s a lot of weight, it can act as a sail on a pole in a windy area,” said Picker, who is overseeing regulatory proceedings related to power pole data. Overloaded poles can snap, causing lines to break and spark. That is what happened with an Edison utility pole in the Canyon Fire in Malibu in October 2007, a fire fueled by the same kind of high winds that whipped through the North Bay. Mark Toney, executive director for the ratepayer advocacy group, TURN, says it is too early to say whether power poles are to blame for the recent fires, but the risk is real. “We just don’t know,” Toney said Monday. 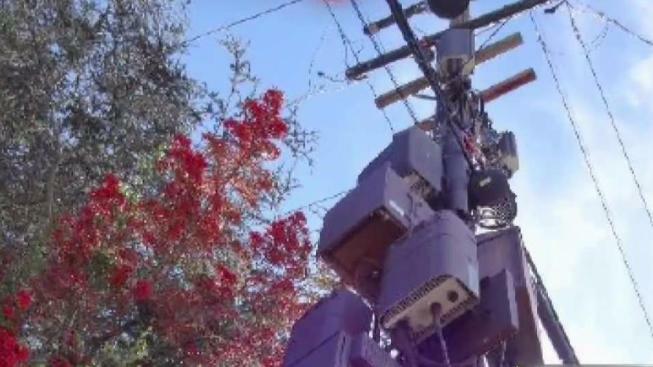 “What we do know is pole safety is incredibly critical right now and that the state and all the utility companies, both the telephone and the energy companies need to work together to make sure we have safer poles all throughout California."